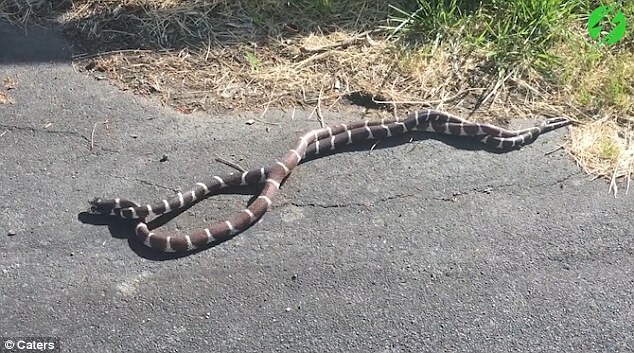 Two king snakes caused a traffic jam by stopping to mate on a busy Californian road. The two reptiles clearly weren’t fazed by the angry drivers who were forced stop their cars and wait for an interlude in their amorous antics. 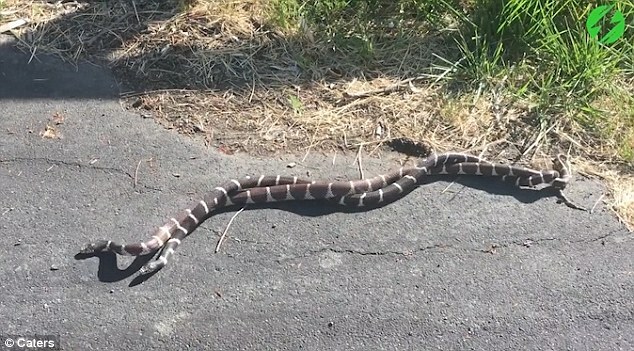 Corbbin Goldsmith pulled over and filmed the snakes’ shenanigans when they interrupted his journey to see friends in Sonoma County, California. The 26-year-old said the rendezvous lasted around 10 minutes. 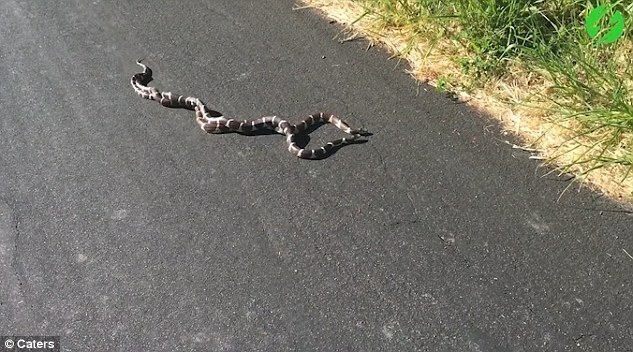 He said: ‘I was driving down the road to meet up with my friends when I saw these two snakes. ‘I got out of my car and walked over to them but they didn’t even care that I was there, so I start filming. ‘My first thought was, oh no, these snakes are attacking each other. ‘While I was watching and waiting for the two ‘lovers’ to cross, a runner came by and helped me identify the snakes. ‘They were king snakes, a rare species of snake in California, that eat rattle snakes. They’re also non-venomous. ‘As we talked, he suggested moving them off the road with a stick. I got a stick from the side of the road, and carefully pushed the couple off into the grass. ‘By then, they seem to have finished what they were doing and went off in different directions. ‘One went off into the grass and the other goes back onto the road. I tried to stop it with the stick, but it was slippery, so I couldn’t pick it up. ‘When I tried to, the snake jolted its head out towards my leg, and tried to bite me. 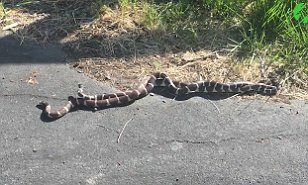 ‘I had thick jeans on so I wasn’t afraid of getting bitten and I also knew that they weren’t venomous, so that helped. Next Next post: What is the World Cup prize money, and how much does each player get?